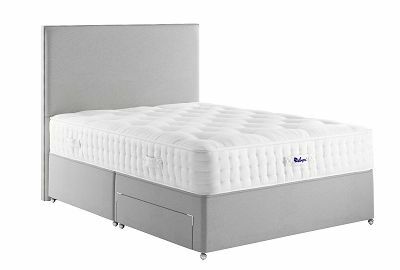 The Relyon Heyford Ortho 1500 3' Divan Bed provides firm orthopaedic support as well as luxurious comfort. Featuring 1500 pocket springs combined with a luxurious blend of cooling cotton and hypoallergenic superflex foam, this bed offers a highly absorbent and breathable sleep environment. The Heyford comes with a choice of base including an ottoman storage option. The Relyon Heyford Ortho 1500 3' Divan Bed is part of the Relyon Classic Collection of luxury beds and mattresses. Offering firm orthopaedic support, this bed combines a total of 1500* pocket springs with a luxurious blend of cooling cotton and a durable cotton foundation for a healthy and breathable sleep environment. The orthopaedic mattress also incorporates hypoallergenic superflex foam offering excellent comfort and support and the firmer springs along the sides add strength to the edge of the mattress. There are three rows of side stitching providing a more robust border than your standard mattress, and the turnable mattress is traditionally hand tufted with wool tufts. 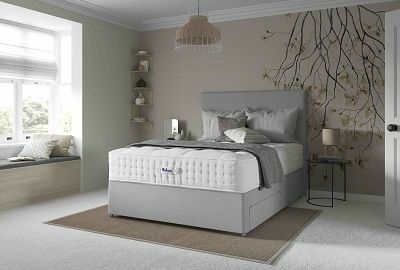 This sensational orthopaedic bed comes with a choice of divan base including a Firm Edge Sprung Divan, Padded Top Divan and Padded Top Ottoman Divan Base. The Relyon Heyford Ortho 1500 Single Bed benefits from a substantial 8 Year Guarantee, and is complete with Free Delivery and Free Collection and Recycling of Your Old Bed throughout Northern Ireland, and Counties Monaghan, Louth and Dublin, in the Republic of Ireland. We’ll also Set Up your New Divan Bed in a room of your choice and Dispose of all the Packaging. Delivery throughout the rest of Ireland available at Highly Competitive Rates.